I was listening to this song by green day as I walked back home the other day, and just as I heard the sentence ‘Time of your life’ I got pondering. I started wondering what were all those instances / nuances / acts / people / happenings which made me feel like I was indeed having the time of my life.. School was one contender for sure with the innocent fun we had, college was something that I’d already tagged as the Best days of my life.. So it had to be something else. No No not TCS. Something else. Something more vibrant, something that has the blue-skin smell of the sea, some place which has more variety with restaurants than what a life time of meals can taste, a place which where one becomes an amphibian due to the humidity, it is our very city made from seven islands—Bombay lately known as Mumbai! I came to this city thanks to with the throw of destiny’s dice. To be specific all thanks to the TCS. Since then over the last 575 days, I’ve been through a plethora of emotions. It was hard to decide where to start off, but then I decided to take a cue from one my earlier articles and hence it had to be the city’s 153 year old backbone, Mumbai Locals. When you land in Mumbai you have people warning you of how over-crowded they are, how many people fall and die out of these, how easy it is to get picked or lose a bag, but what many people don’t tell you is how addictive these are. The cool breeze as you hang out of one, or the modern train yoga asana that you learn by standing funnily or the fights for seats to the bhajan groups on trains and even the train friends you make. It is what I’d call an intangible luxury! But the same friend, who told me about Mumbai Locals, also happens to be the drummer of a leading Mumbai-based band and hence he invariably happened to talk about music & Mumbai. How the music here is a brilliant portrayal of emotion in words. The first thing that obviously strikes your mind is Bollywood. A city where every actor comes to become a star and the rest of us come to get a glimpse of them, once they turn stars. 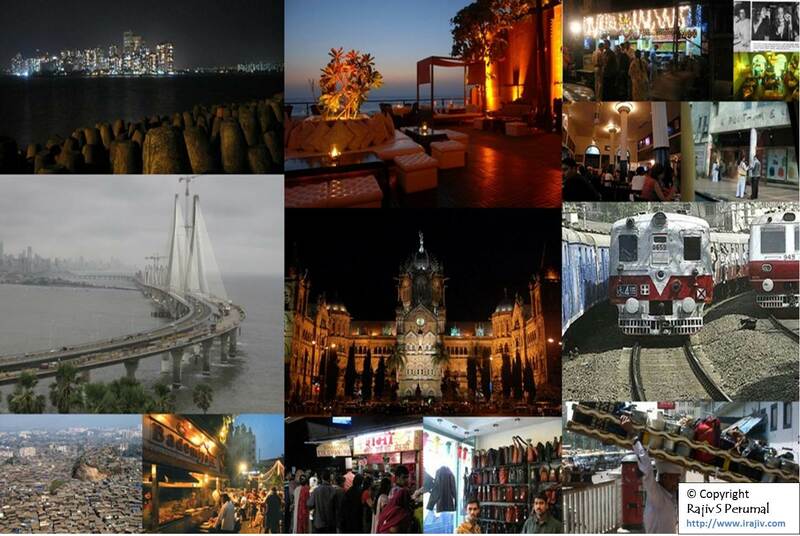 But Bombay also has the other side to it. The music from the west has had its own strong influence on this city. In fact in the 70’s Led Zepplin had come to India in an attempt to start a recording studio, they ended up staying @ the Taj and spending most of their time at a local disc called Slip Disc. They fell in love with the city so much, that over the next few years whenever they had to go to Australia or Singapore they managed to make it a point to stop by in Bombay. In fact they even got to jam with Indian artists and that forms a part of their collectives called the ‘The Bombay Sessions’. Music was in the blood for this city. But Mumbai surely aint complete with just a backbone in the form of trains and blood in music. The city needed legs which would be attributed to the always buzzing streets of Mumbai. I still remember the 24th Oct last year, it was my friend’s birthday and we were on our way to a lounge by the beach called Aurus in Juhu to celebrate @ about 2. To our surprise we were stuck in a traffic jam for 30mins, but instead of getting irritated all of us were elated with the fact that this city has so much life @ that hour of the day! It’s not just Juhu go anywhere from Marine Drive to the ever-cramped Saki Naka and you won’t be disappointed! Life! Well the limbs of the city won’t be complete without the hands, which would be Dharavi. A lot of you may think I’m crazy! But just hear me out.. For a first the total business @ Dharavi is estimated to be a whopping $650Mn. Now that my dear friends is a hell lotta money! For the record nearly all the farzans (an Indian snack, mostly used as a side-eat) that is sold in Mumbai comes outta Asia’s biggest slum. It is also famous for its authentic cheap leather goods, which again are re-sold in stores at Colaba (obviously at a higher price) where one would find it ‘Kewl’ to shop. But that’s not all, the HBR Case worthy Dabbawalla’s of Mumbai operate pre-dominantly out of Dharavi. So with all this said I guess the always planned re-development can wait! Now.. Coming to my favourite, the tongue of this city! This can be attributed to the mouth watering delicacies that you can taste from a Sunday Sindhi Breakfast at Tharu Sweets to a Parsi lunch at Britannia & Co to high tea at theobroma, a drink @ Leopolds, hop skip and jump and you reach Bademia for succulent chicken for dinner and finally yum homemade age old ice creams from K Rustomjee. Apart from this you could also get side-eats from a yum lassi’s @ parsi diary to a sumptuous falooda at badshah’s to generously butter Pav Bhaji @ Sardar PB or chaat at Chowpati. I better stop at this else I’m goina have to go and get something to eat as these bare names are enough to get me hungry again just an hour after dinner! I surely need to dedicate a couple of more articles or may be a book in order to complete the rest of Mumbai (may be the next version of the ever famous ‘Shantaram’)J! But I surely cannot finish without mentioning the Spirit of Mumbai that was shown to the world when people got to work hours after the train blasts and the Jewel of Bombay, The Queen’s Necklace. Man you so have to sit there on a rainy day with the rain lashing against your face, and sip into a nice thick yummy ‘Bachelors’ chocolate shake! It’s just Eternal Bliss! Hope that would stop you from saying 'Goodbye'!